Donors are more likely to support artists and organisations if they believe in your mission or vision. The social impacts or outcomes can the best way to describe why your project is important – it’s not necessarily what you’re doing that will convince a donor but the outcomes it will have. How does your project make a difference? Does your project link in any way to other causes that donors care about such as community, environment, aid, health, education? 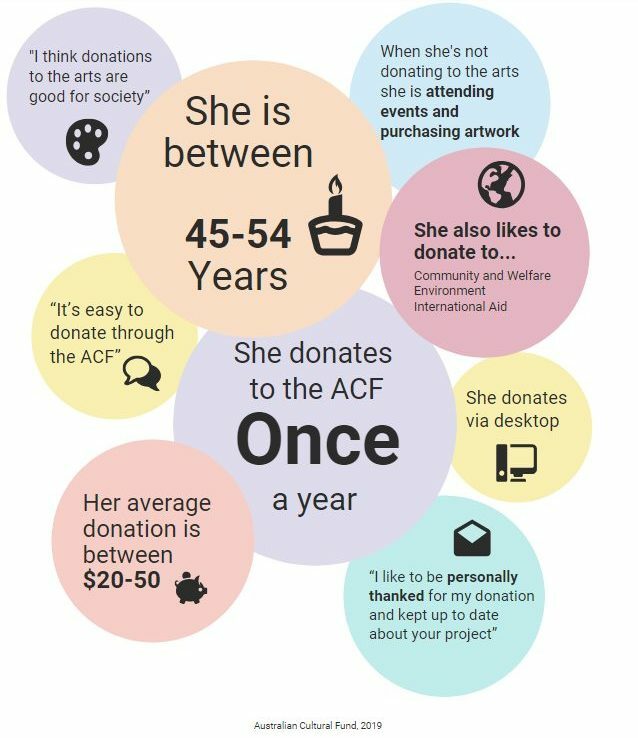 Donors feel the tax deductibility provided by the ACF is a very positive feature, and the more you are asking the more key this becomes to your messaging. Donors are highly likely to give to the arts again in the next 12 months – so keep them engaged!! A key factor for donors in deciding to give to you again down the track is whether your project is worthwhile, compelling, and has links to a cause. *Disclaimer: This is a snapshot based on those donors who responded to our survey, so it doesn’t represent all donors and definitely every donor is different! Please use this as anecdotal info only, to help you think about who you might approach, but don’t forget to make your reach targeted and wide.